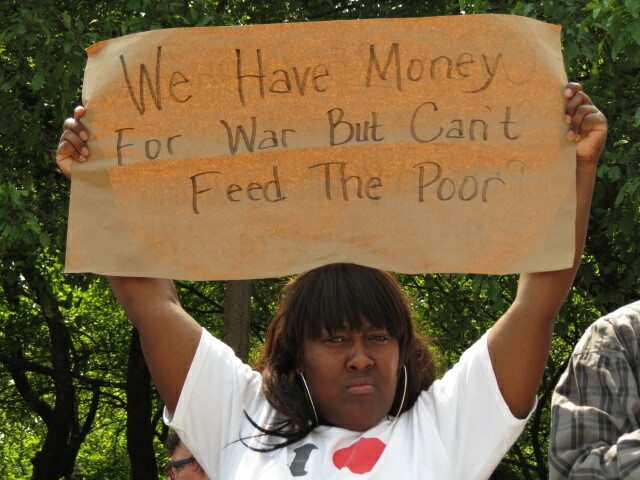 A protestor at the anti-NATO demonstrations. Photo by Mary C. Piemonte. “No to the NATO/G8 war makers! No to war and austerity!” chanted the massive crowd who gathered around the Petrillo Band Shell in Grant Park on May 20 to protest the summit of the North Atlantic Treaty Organization or NATO that was held at McCormick Place this past weekend. With officers from the Chicago Police Department, Illinois State Police and the U.S. Department of Homeland Security lining the march route, local, national and international speakers from various ethnicities and coalitions around the world, including Germany, Pakistan and Egypt, joined forces in solidarity, calling for the end of war in Iraq, Afghanistan and other places, and for the troops to be brought home. Justice for immigrants and all oppressed people everywhere. Economic justice and jobs for all. Money for effective education, health care, housing and the release of political prisoners such as the Cuban 5, who were imprisoned in Miami and charged with spying for Havana, according to members of the Chicago Committee to Free the Cuban Five.